Little Explorers Can Experience Great Moments! Our experienced counselors are caring and dedicated to providing safe adventures for your child. Each day’s activities will nurture your child’s sense of wonder and connection to the environment, helping them to feel at home in nature. 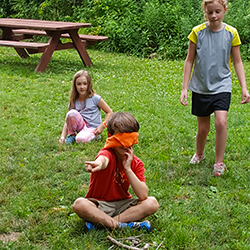 Limited to no more than 11 campers per session, campers will explore Baltimore Woods, learn about the various plants and animals found in the woods, play nature-related games and make nature crafts. 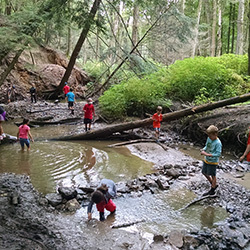 Play, discover, and get wonderfully wet this week at the woods! This week’s adventure includes plenty of time exploring our creeks and ponds in search of frogs, crayfish, water bugs, and other friends who love the water. Come check out the pond and streams at Baltimore Woods – it will be a splashing good time! Fairies, Elves and Trolls, Oh My! Join us as we discover the magical world of the wee folk! 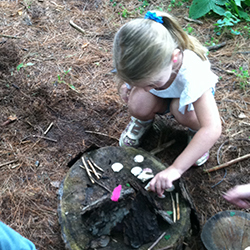 We will learn about these little spirits of the forest through stories and imaginative play. While exploring the trails we will search for the best habitats to build our new friends’ homes. From birds, to frogs, to flowers, life cycles are everywhere! 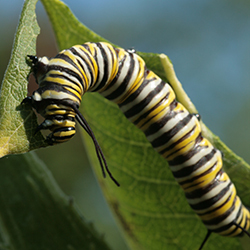 Join us on the journey of watching plants and animals change as we observe nature around us. From fun life cycle relay races to caterpillar scavenger hunts we will be traveling around and around again as we transform into these fun creatures! Calling all budding architects! This week we’ll be busy as beavers as we learn how to design and build natural structures just like all the animals do here at Baltimore Woods. 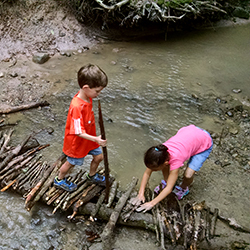 We’ll hike down to the stream to build beaver dams, weave bird nests in the forest, and dig dens of our very own, so grab your hard hat and let’s get building! Ribbit! Ribbit! 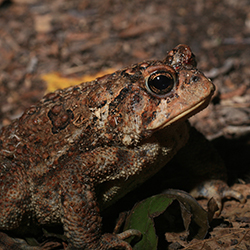 Our amphibian friends are calling you to come hop around Baltimore Woods. We will spend a week learning and exploring as we search for these quick critters. Where do they live? What do they eat? How are they alike and different? You’ll be an amphibian expert by the end of this week! Using our 5 senses we are going to explore the world around us just like the animals here at Baltimore Woods. We will be feeling and seeing the natural world, play games using our sense of hearing like a bat, and walking around the forest like a fox using our sense of smell. Join us on a sensational adventure through the eyes, ears, noses, and whiskers of the animals! Bug jar? Check! Butterfly net? Check! Need to explore the outdoors? Check! Sounds like you’re all set for a week of adventure as we get up close and personal with the world of insects. 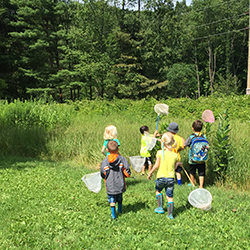 We’ll race after butterflies and dragonflies, scour the grasses for praying mantis, flip logs for beetles, and search the stream for stoneflies. It’s going to be a buggy bonanza! This camp is limited to 11 participants per session. Sessions are themed and campers can attend multiple sessions. Camp will begin daily at 10am and end at 12pm. *A minimum of six campers must be enrolled in order for a camp session to take place.